The FG Series has been our most popular model that we have supplied to our customers. Available in three models (30 Kg, 60 Kg and 150 Kg) with two different platform sizes (300mm x 380mm) and (390mm x 530mm) these scales are very reliable, durable and value for money. The bench model (see inset) with 30 Kg limit is our most popular model for mobile applications since it has a very long battery life (running on 4 x C size batteries) and compact size. Coupled with the optional RS-232 output board this scale can be connected via a serial cable to your PC or mobile computers. This series of scale is waterproof and trade approved. We have successfully deployed these out on farms in semi-outdoor environments. With the optional RS-232 output interface installed weight data is transferred at the press of a button to a mobile computer such as the Motorola MC-9000. 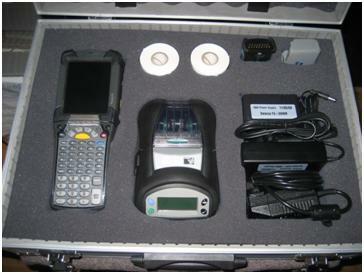 The Emroth Technologies Scale data to Virtual Barcode Interface unit has been developed to provide a low cost interface between serial scales and barcode scanners. This means that a normal barcode scanner can simply scan the Virtual Barcode Interface unit and collect the scale weight. This saves time and is much more actuate than manually entering or recording data. A&D Mercury are a leading manufacturer of scales & balances and have been in business for over 60 years, constantly providing high quality products. For this reason we choose to distribute their range of scales and balances. While Barcode Datalink has access to the entire range of A&D Mercury products, we specialise in just a few models since we have experience with integrating them into both desktop and mobile applications. Are you keying in the weight into your PC? Why? We have two solutions to avoid this error prone step! Press the “Print” button the scale and send the data via RS-232 to your PC application. If you need to capture weights out in the field with a mobile scale and record that information in a mobile device we can write a customised application to suit your requirements. We can provide a "solution in a case" that incorporates weight and barcode (and/or RFID) data capture, reporting and BlueTooth wireless printing to a mobile receipt printer like the Zebra RW-220 or RW-420.